Yesterday we kicked off our immigration unit with an A-MAZING visit from a 90 year old woman who had immigrated from Germany back in the mid 20’s. She was a sharp as a tack–and her story was so interesting. I hope I can remember so many things when I am her age! I can barely remember to put two shoes on now and I am half her age! This unit is one of my favorites . . . there are so many fascinating things to learn and so many great pieces of literature that can be tied to the unit. I always start off–before I even tell them what we are studying–with a close read of Eve Bunting’s “How Many Days to America”. What I find so interesting about this text is that it isn’t an “in your face” immigration story; instead, it is a story about people . . . about decisions that need to be made . . . about family . . . about gratitude–and so much more. So, I ask my students to come by the easel with their reading response notebooks and I tell them we are going to be reading closely and tracking our thinking. I explain that I will read a few pages and then will pause and give them time to write their thoughts. They are welcome to write as I read if they have something urgent to record. At each pausing point (I think I stopped 5 times during the text), I ask them to turn and talk to a neighbor or two close to them and then we share out as a class. As a class, we “track our thinking” as I record on a chart. We practicing piggybacking off others ideas, asking questions, and “reading closely” to notice important elements of the text. I start off writing in one color . . .
Then as we get deeper into the text I switch to another color . . .
. . . and then finish in a third color. Organizing the chart with colors allows us to “notice” things about how our thinking changes as the book progresses. I love to hear the students saying things like, “Well, at the beginning I was wondering about . . . but now I know that . . . ” and so on! Helping them see to refer BACK to the text to proe their thinking is so important. Simply saying, “Is there a war?” isn’t nearly as meaningful as when a student says, “I wonder if there is a war going on because I noticed that…”. How did your understanding change as we moved through the story? 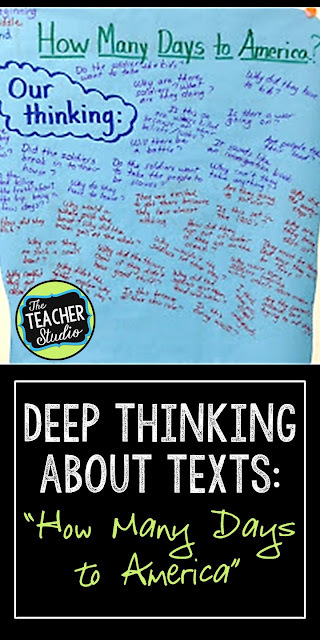 I know this isn’t rocket science, but if you are looking for a different way to engage students in a text–especially a text that ties so well to your content, give it a try! It engages all the students, practices their discussion skills, their upper level thinking, and leaves a “trail” of thought that we can refer back to as the unit unfolds. After our discussion, we pulled down the map and drew inferences about the setting . . . about why we thought the author wrote the text . . . about unanswered questions. It was a great “kick off” to our unit–and led us to tonight’s homework. This really is one of my favorite books to read with students…so much inferring, so many great discussions. I have actually written up some of my thoughts and questions in this little resource if you find it helpful! Just click the image below.